Some tasks are suggested by Reply itself, and some can be manually created, changed and managed. Find out how you can do it and get started! The article describes how to create a new task and edit an existing task. Navigate to the Tasks page of your Reply account and click the New task button. The system opens the New task dialog window. In the Task type drop down list, select the type of the task. More about task types. In the Task contact drop down list, select the contact you want to associate with the task. In the Description field, enter the description of the task. This may be any relevant text. Click Save. The system creates a new task. Note: the system automatically sets the Start date date and time approximately thirty minutes after the current date and time of the user. The Due date is thirty minutes after the Start date by default. To change the duration of the task, change the Due date-time. The task automatically becomes Due, after the Due date expires. Currently only one-day tasks are supported. Find the task you want to edit and click on it. After you have finished editing the task, click the Save button. To add a participant, click on the +Add participant button. 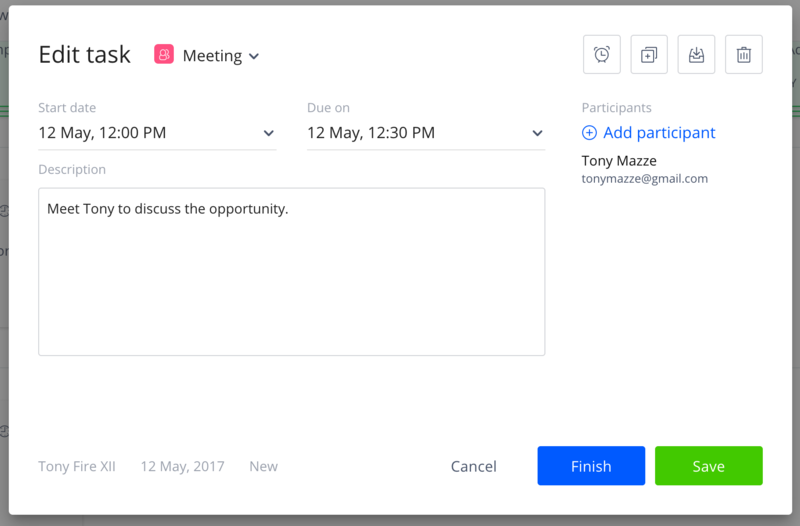 Right now you can add multiple prospects to a task (up to 50 participants). All tasks are related to the tasks creator, so we support one user to multiple prospects/participants pattern. In order to get more information about a participant, click in the Participants list; the prospect sidebar for the particular prospect opens to the right. You can access prospect info, activity, campaign history and more in the sidebar.